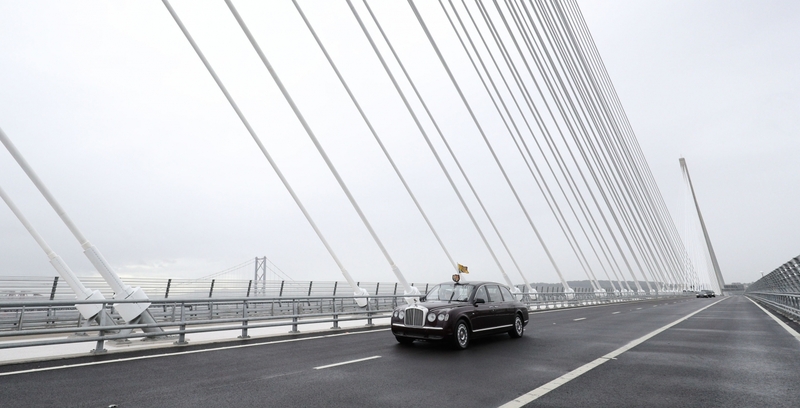 The Queen, accompanied by The Duke of Edinburgh, has opened the new Queensferry Crossing over the Firth of Forth. On arrival at the South side of the crossing, The Queen and The Duke were met by The Lord Provost of the City of Edinburgh, Frank Ross and Nicola Sturgeon, First Minister of Scotland. The opening of the new bridge comes exactly 53 years since The Queen opened the other road crossing over the Forth - The Forth Road Bridge. The name 'Queensferry' comes from Queen Margaret of Scotland who established a ferry over the Forth in the eleventh century. Over 10,000 people were involved in building the new Queensferry crossing and thousands more have been indirectly employed and have benefited through the project's supply chain. After meeting workers, staff and local children, The Queen and The Duke travelled over the new bridge and where they were treated to a spectacular flypast by the Red Arrows. Although the bridge initially opened to traffic last week, over the weekend 50,000 people had the unique chance to walk over the bridge. On the North side of the bridge The Queen delivered a speech to commemorate the opening. First Minister, The Duke of Edinburgh and I are delighted to be able to join you, and the people of Scotland, to celebrate this extraordinary achievement. There was also a traditional folk performance and a poetry reading by the Scottish Makar. Before departing The Queen unveiled a plaque to celebrate the opening and was presented with a posy.